The orthopaedic curriculum at Rush features a yearlong intern skills curriculum, dedicated surgical training, and over 150 interactive conferences that all residents attend annually. Rush is home to world class orthopaedic surgeons that are leaders within their respective fields. Other surgeons travel great distances to hear many of them speak, whereas the residency has the benefit of frequent educational experiences with these same leaders. Lectures are given and moderated by faculty each Monday evening on a wide range of core orthopaedic topics. The curriculum features 100 topics that rotate on an annual basis. Every Wednesday morning faculty and guest speakers present on the foundational principles and hot topics in orthopaedics. Residents also present educational case based presentations under the sponsorship of a faculty member. Each month the faculty, fellows, and residents gather to discuss and learn from the challenging cases of the previous month. 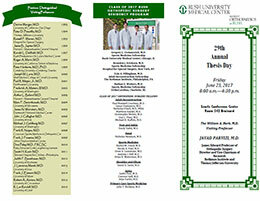 Faculty in each subspecialty host several conferences each week for residents. Conferences range from interactive lectures to case based discussions and journal clubs. Each month a faculty member hosts the residents to discuss and critically appraise recent literature from leading orthopaedic journals such as the The Journal of Bone & Joint Surgery as well as major subspecialty journals. Residents gather each morning to discuss and learn from the call cases that came in the day prior. Dr. Monica Kogan, a pediatric fellowship trained orthopaedic surgeon and Residency Program Director, leads an interactive conference each month on important topics in pediatric orthopaedic surgery. Dr. Steven Gitelis and Dr. Matthew Colman, leaders in musculoskeletal oncology, each month host a case based discussion. The aim of the conference is to provide residents with a foundation to systematically approach oncologic cases. In addition to weekly conferences and lectures, residents have the ability to improve their surgical technique and anatomical understanding through wet lab experiences and surgical simulators. Cadavers are available for anatomic dissections and arthroscopic labs are held multiple times each year. In the arthroscopic labs, residents practice their arthroscopy skills on cadavers in operating rooms set-up and equipped with the same arthroscopic equipment used for live procedures. The Orthopaedic Department at Rush also features two state of the art surgical simulators which residents have access to at all times to improve their surgical skills. These simulators provide real-time feedback that residents can use to enhance their surgical skills on cases such as arthroscopy and hip fractures. The intern skills curriculum features a 2-week course at the beginning of residency. Each morning for the first two weeks of residency, interns review the core principles of orthopaedic surgery. Topics include reading radiographs and advanced imaging, basics of fracture management, and skill workshops on power tools, suturing, knot tying, splinting, and casting. Throughout the rest of the year, the curriculum progresses to more advanced topics such as principles of internal fixation, plates and screws, surgical approaches, pediatric fractures, and introduction to arthroscopy. Interns throughout the year work extensively with cadavers on surgical approaches and implants such as intramedullary nails, plates and screws, and arthroplasty. Funding is provided by the Department of Orthopaedic Surgery for residents to attend several different conferences throughout their training. All second year residents attend this extensive hands-on course on trauma principles. 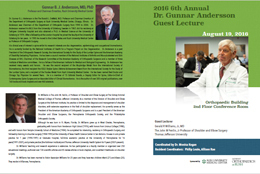 The conference is a combination of lectures and saw bone labs led by national leaders in trauma surgery. The American Academy of Orthopaedic Surgery (AAOS) Annual Meeting is the largest orthopaedic meeting in the world covering all subspecialties. All fifth year residents as well as residents presenting podium presentations attend the annual meeting each year. The meeting features the world-class research in orthopaedics as well as a full day of lectures dedicated to residents. The day covers topics on business practices such as contract negotiation, malpractice insurance, billing and coding, finding your first job, and marketing. All fifth year residents attend the AAOS orthopaedic board preparation and review course in the Spring of their fifth year in Chicago. The conference reviews the key topics for the boards. Residents of all years are encouraged to attend additional courses. Residents receive funding from both Graduate Medical Education at Rush University Medical Center as well as from the Department of Orthopaedic Surgery to attend. One of the benefits of being located in Chicago is the proximity of Rush to the AAOS headquarters in Rosemont, IL. Orthopaedic residents at Rush have attended dozens of different courses at the AAOS headquarters and at other locations nationally to enhance their orthopaedic education. Research opportunities are one of the strengths of the orthopaedic surgery program at Rush. Residents have ample opportunities to get involved in research in all subspecialties. Residents that have their research accepted as oral presentations at one of the major orthopaedic surgery society meetings (e.g. AAOS, AOSSM, AAHKS, AOFAS, POSNA) are funded to attend and present their work by the Department of Orthopaedic Surgery.